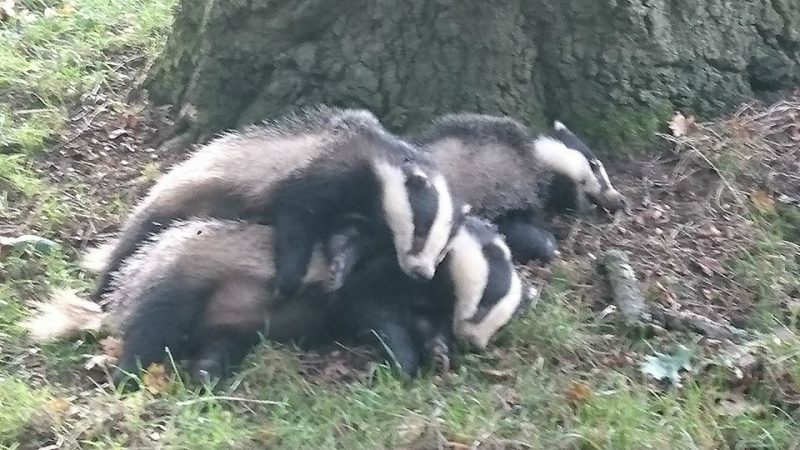 We’re hearing that the badger cull is to be extended by at least a week in the Wiltshire zones, one of which we have been working in for the last six weeks, as it is likely that the cullers have failed to hit their minimum targets. Over the past six weeks we’ve seen many breaches of the cullers own guidelines, signs of illegal badger persecution and terrible bio-security and farming practices in TB hot spots, all bringing into question the cull and its humanness, effectiveness and safety. Now is the time to step up our efforts – we’ll be doing our utmost to protect badgers in the zone until the cull is over. A welcome break from the 5am starts for cubbing today as we went to the Ross Harriers opening meet of the season, at Warren Farm, Lea, Herefordshire. They left at around 11.30 with us following. We monitored their movements as they went from field to field trying to put up a hare to chase (most Harrier packs hunt both hare and fox), with little luck. The day seemed pretty disjointed for them, obviously with limited areas they were allowed to hunt and a keenness to get away from us whenever we caught up with them. Sabs were with the hunt as they were drawing a kale field, perfectly positioned to see a rather plump fox fleeing past. 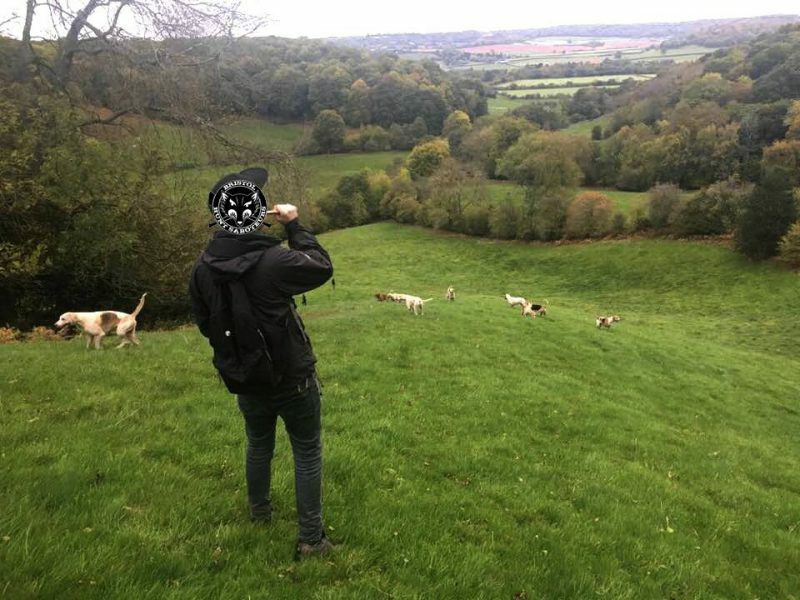 As supporters were seen alerting the whipper-in as to the foxes whereabouts and a couple of hounds showed an interest in following its line, sabs were straight into action spraying citronella after it and ‘rating’ the hounds back (telling them not to follow). We let the huntsman know that the fox had fled and he made the sensible decision to gather up the hounds and move away from the area. We were following on in our vehicle when we drove past the bulk of hunt followers, some of who threw stones at us. A few bounced off the vehicle but one smashed the sunroof, showering glass on those inside. Thankfully nobody was hurt and after a bit of a hold up clearing away the broken glass we were back in pursuit of the hunt. We watched them drawing a few more fields around the meet, before catching up with the huntsman who was on foot and gathering up the hounds, before heading back to box up. 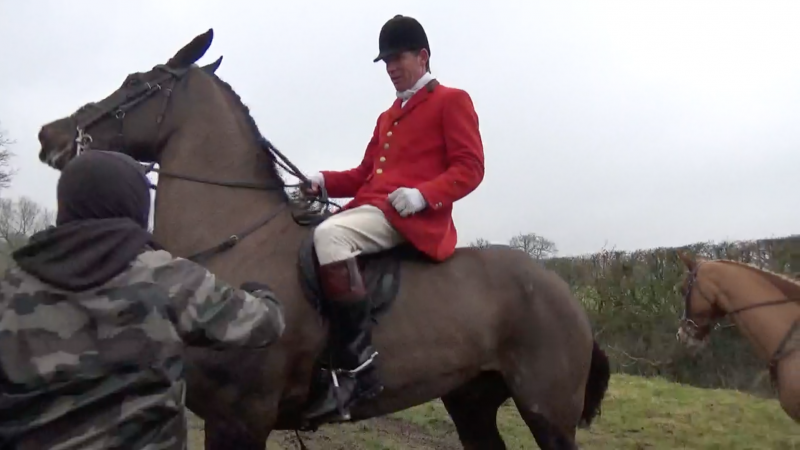 Throughout the day a number of hunt followers were seen displaying all the lowest levels of maturity, with a mounted follower swinging his riding crop at sabs when he went past and a group of drunken car followers threatening us with violence from the off, drink driving, blocking roads and then squaring up to and threatening members of the public who asked them to move! We have to ask the Ross Harriers whether this is the kind of behaviour that they want to be associated with? They are surely by now well aware that we will expose any violence and vandalism aimed at us, that it is not a deterrent and in fact only makes us more determined and them more of a focus. On Saturday 16th September, acting on a tip-off, we headed over the bridge to sab a meet of ‘The Ledbury South’. 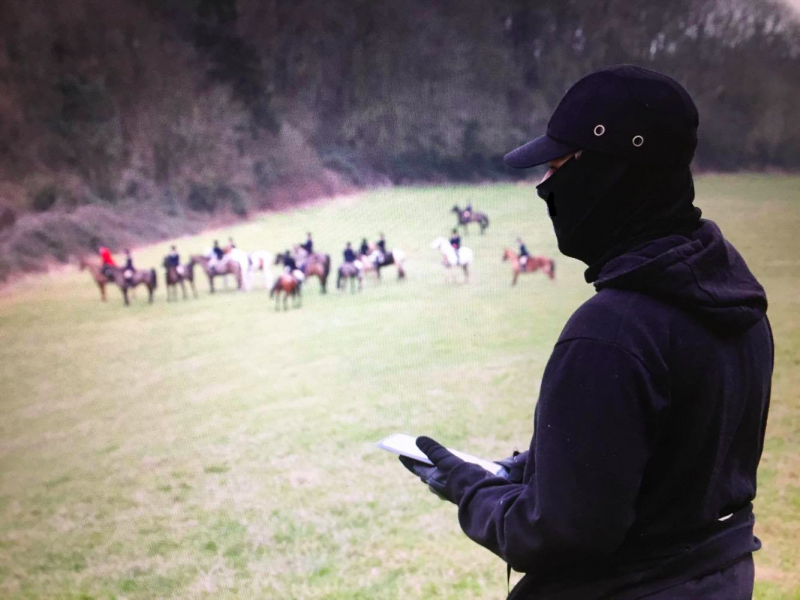 The hunt consists of riders and staff from The South Herefordshire Hunt (who are currently at the centre of a police investigation for feeding fox cubs straight to the hounds inside their kennels) and members of The Ledbury Hunt. 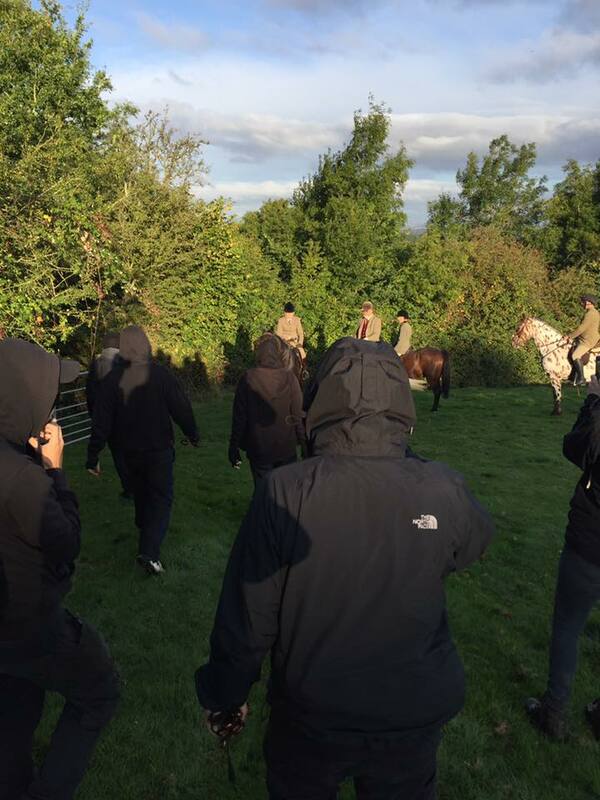 The hunt moved off at 7am from their meet in Orcop with one group of sabs watching every move they made. You would think this lot would be hunting within the law but this was the most blatant illegal hunting of fox cubs we have seen in years. We decided to intervene at the first opportunity and took control of the hounds, forcing the hunt to move off in an attempt to lose us. This set the tone for the rest of the morning as we continuously took the hounds away from the hunt and to our feet. One fox was seen fleeing to safety, it was seen by hunt supporters but there was little they could do with sabs everywhere. They finally threw in the towel at 10am after a few more failed attempts at killing wildlife. THREE COUNTIES MINK HOUNDS FOUND AND SHUT DOWN! 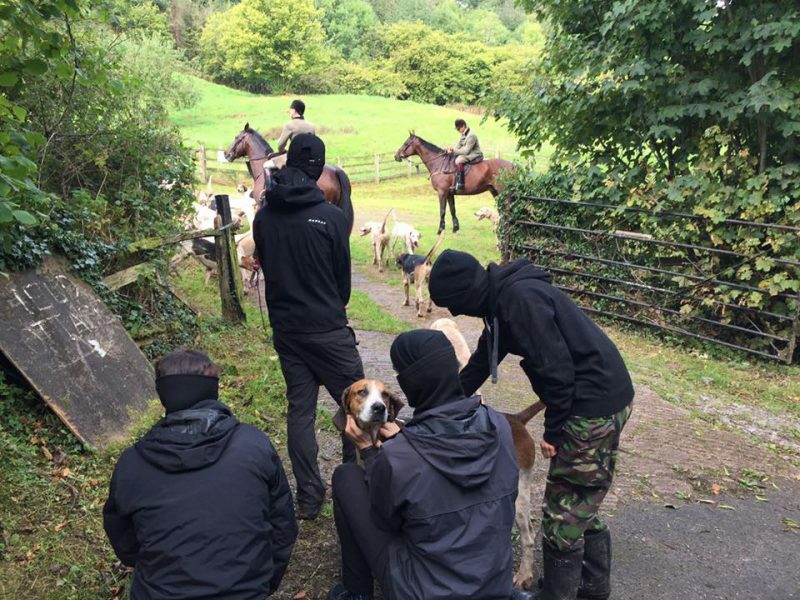 On Saturday, a few of us joined up with a collection of sabs from Bath, Severn Vale and South Wales today, after receiving a local tip off that the rather illusive Three Counties Mink Hounds would be hunting around Michaelchurch Escley, Herefordshire, near to the Welsh border. After a bit of standing around trying to hatch a plan, the hounds were boxed up and the hound van was outta there. Odd behaviour if there was nothing illegal going on! We watched as hunt staff and supporters waited around looking rather fed up, before most of them drifted off. Sabs remained in the area ready to go back into action if they tried to sneak back, until we received word from a spotters vehicle that they had picked up the hound van way to the east, heading back to the hunt kennels in Kinnersley, Worcestershire. A very good day with the Cotswold Vale Farmers’ Hunt today, in and around Sandhurst, Gloucestershire with our mates from South Wales Hunt Saboteurs & Bath. Splitting into two groups at the start of the day meant we were continually tag teaming, being able to get ahead of the hunt at every move they made. At one point we positioned ourselves next to an area of woodland they were about to draw, with the other sabs pursuing the hunt from behind. 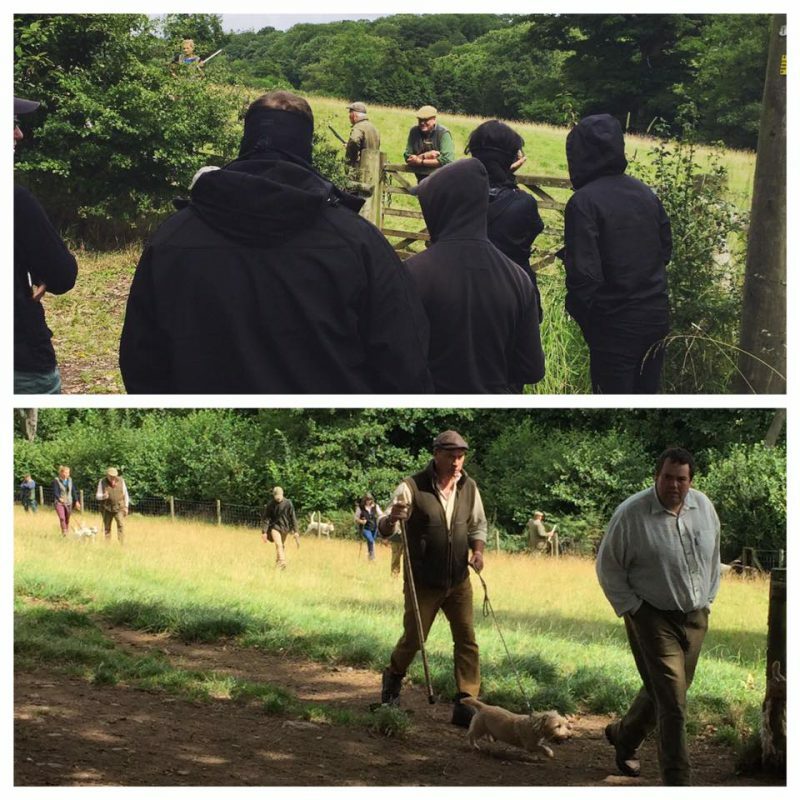 Within seconds we saw a fox bolting from the wood, in full view of hunt supporters. With no time to lose, we covered its line with citronella, got our whips out and spread out ready to ‘rate’ the hounds to stop them if they were to take chase. As the hounds worked through the woodland with us waiting to see if they would pick up on the fox, a second was seen running from further up the woodland, straight past a rider who was on point. Again we leaped into action, covered it’s scent with citronella and got ready to stop any hounds. 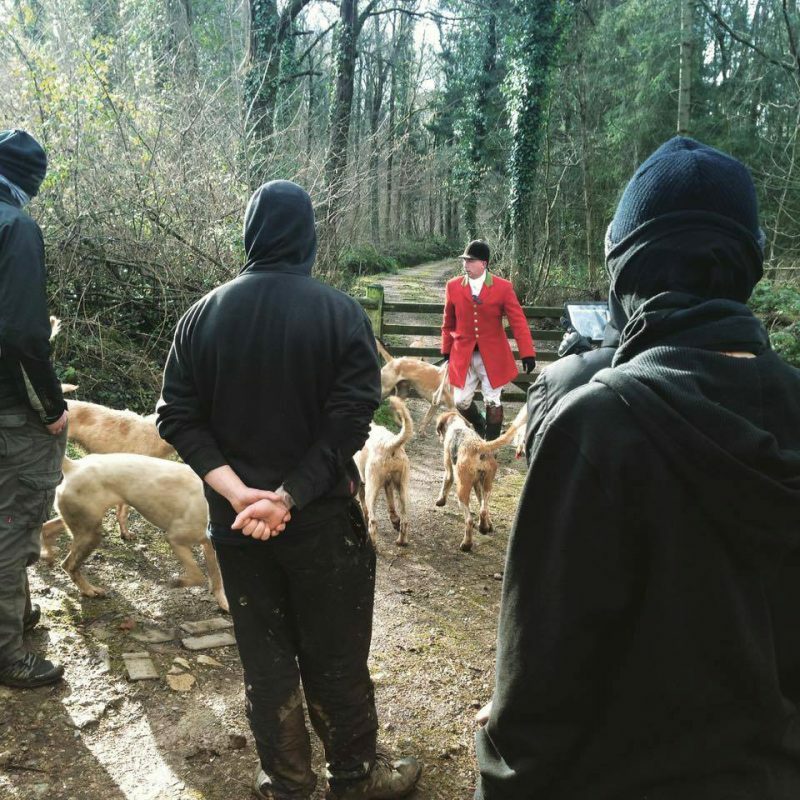 By this time our other sabs were with us, along with the huntsman, who thought better of hunting either of these foxes with us present, gathering up his hounds and buggering off in another direction. A great feeling! Everywhere the huntsman tried to run, sabs were popping out in front of him, using the pincer movement to great effect. Later in the day we came across the pack of hounds in cry, with no hunters in sight, crossing a road and trying to get through a hedge ahead of us. We were able to slow them down for a bit, giving whatever they may have been chasing a bit more time to get away. We caught up with them very quickly and all seemed quiet, so pretty sure they didn’t have any success with that one either! They called it a day just after 4pm, and we set off to celebrate a job well done. Along with South Wales Hunt Sabs and Three Counties Hunt Sabs we returned to the Ledbury Hunt today, for one of their few Saturday meets of the season. 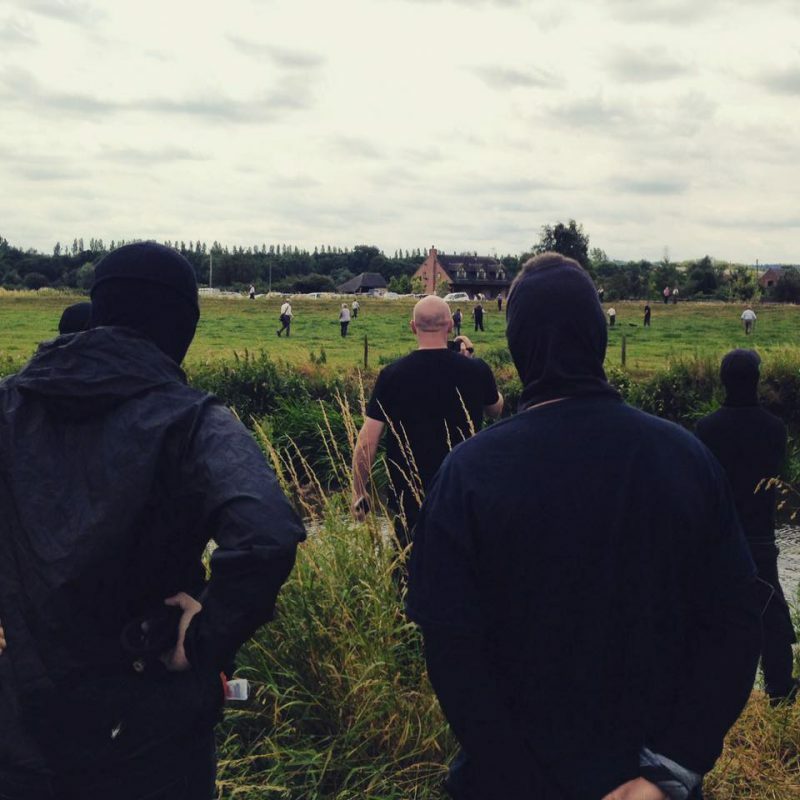 Unlike the last time we visited back in December, when the hunt’s terriermen attacked sabs who stopped them digging out a fox from a badger sett, the day passed without incident. They left their meet, Tweenhills Farm in Hartpury, Glos, at 12.30. Despite the huntsman trying his usual trick of trying to put as much distance as possible between himself and sabs (including riding along the busy A417 with hounds all over the shop), between our different vehicles and teams of foot sabs we ensured that the hunt were kept under tabs all day. A couple of furry friends were seen fleeing from where the hunt were at different points in the day, having their scent covered by liberal amounts of ‘Odeur de Sabbin.’ Hounds were heard picking up a couple of times, but never for long. The hunt returned to the meet and boxed up at about 4pm. FOX SAVED AT MEET OF CURRE AND LLANGIBBY HUNT. YESTERDAY, we paid an overdue visit to The Curre & Llangibby Hunt with our friends from South Wales Hunt Saboteurs & Bath Hunt Saboteurs. We arrived late at the meet but it turned out to be a blessing in disguise as the hunt had left and thought their murderous activities would go unnoticed; sadly for them, we were soon close on their tails. We worked relentlessly to keep the hunt in our sights. The first half of the day saw the huntsman on foot attempting to work his hounds through thick coverts with us making sure he didn’t get up to any mischief. Despite the fact they would maintain that they were simply trail hunting, trails cannot be effectively laid through thick covert. And whilst they were following ‘trails’ and we were following them, a helicopter was following us as the hunt felt they needed protecting and at the taxpayers expense no less (a pricey sum of more than £1000 an hour to be in the air). After managing to keep close to the hunt, we soon watched as they started pushing their hounds through a large area of woodland. The terriermen were close by keeping an eye on us but also waiting incase any fox was to break. Sure enough, within a few minutes a fox shot out from the covert and the hounds had soon caught it’s scent. With our hearts in our throats, we managed to get in a great position. The fox sped straight past us and we were able to ‘rate’ the hounds back to the huntsman and cover the fox’s trail with citronella spray. We, therefore, gave the fox valuable time to get away to safety. In all the years that our group has been sabbing, we have never come this close to seeing a kill first hand. As a result of us spoiling their bloody fun, the terriermen tried throwing their weight around but we stood our ground and pushed on back in pursuit of the hunt. For the rest of the afternoon we continued to intervene and kept the hounds from effectively hunting foxes. The stubborn hunt stayed out way past their bedtime but we were there every step of the way, but we were very much relieved when they finally packed up their exhausted hounds.